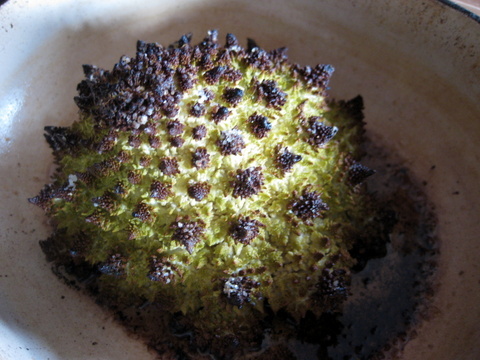 Whole Roasted Romanesco: Good Idea or A Waste of a Fine Vegetable? Everyone’s roasting brassicas at the moment – Jamie Oliver, Julia Moskin in the NYT… they’re all at it, whether with cauliflower, broccoli or romanesco. A whole veg. done this way sounds tempting and should make a pretty dramatic statement. Worth a try? I decided to give it a go with a single, beautiful head of romanesco. This rather elegant member of the broccoli family always reminds me of the pictures in that great children’s book, The Biggest House in The World by Leo Lionni – the one about a snail who wriggled and wished and contorted himself in such a way that his shell sprouted the most beautiful excrescences, and his house was the envy of all and surely the biggest in the world (spoiler alert: it ended badly for him). Anyway, his shell grew lovely pointy bits, just like my romanesco. The recipe that pulled me in was by Julia Moskin in the New York Times. She used a cauliflower but I don’t care much for the flavour, preferring romanesco. I trimmed away all the greenery and removed most of the core, without allowing it all to unravel. 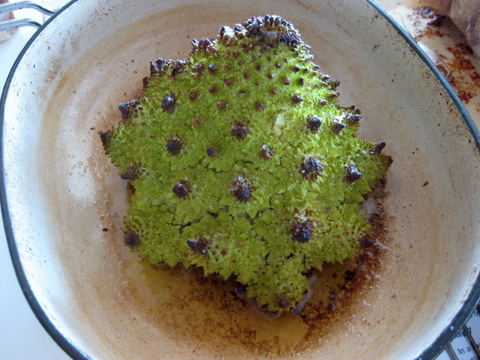 Then I laid it core side up in a roasting pan, dribbled my best Catalan olive oil over it so it crept into all the cracks and crannies, turned the romanesco right side up, dusted it with sea salt and put it to roast in the oven at 200C. After about 1 hour it looked like this. To go with it I debated between the sauce suggested (toasted almonds, anchovy fillets, garlic, butter, olive oil and butter blended together with a splash of vinegar and some herbs) and my fave salsa romesco, the kind they serve with calçots in Catalunya round about now (toasted almonds, peppers, tomatoes, garlic and olive oil). Romesco was tempting (romesco is always tempting) but the anchovy one won out – and gave me the chance to press into service some yummy little anchoas from L’Escala which found their way into my stocking this year. And the verdict? Well as you can see the colour was dire. Sad to say, the taste wasn’t up to much either, altogether too cabbagey – as tends to happen when you cook brassicas to distraction. The anchovy sauce was a bit too salty and awfully grey. For next time I’m thinking steamed, so the romanesco keeps its bright verdant colour, and I’ll serve a splash of that glorious, sunset-red romesco sauce to go with it. Watch this space. You’re right Sue, the result looks unappetizing. Last night I roasted cauliflower after having removed the core and separated the remainder into small pieces. I just added olive oil, salt and pepper. It turned out great; the only problem was that it shrunk drastically. Not cabbagey at all. Then I must try it with cauli, Bob! Did you do a sauce? Or shower it with Parmigiano, something I’ve also seen in recipes? No, no sauce Sue. But the dish I served it with (chicken thighs) had a sauce with lemon, anchovy, garlic, capers and red pepper flakes, so plenty of flavor on the plate. By the way, I just sent your Alsace restaurant piece to my niece; she’ll be there for a week in July (staying in Bergheim).